Warm greetings from me, Miss Libussa, Czequestria’s top pony! In times of legends, when the land of ponies was ravaged by distrust and dread cold, Chancellor Puddinghead, Princess Platinum and Commander Hurricane weren’t the only ones, who went to seek out a new land to settle. It was shortly after their departure when the brothers dukes, the elder earth pony Čech and the younger unicorn Lech, disgusted by the incompetence of their leaders to reach a diplomatic solution, have decided to take their loyal ponykind and try their luck elsewhere. The plan was to continue onward, into the center of this newly discovered land and further from their frozen homeland. For it was in the center, where they thought to be completely safe from the dreadful weather and ill nature that troubled them in the past. Many days have passed since their first arrival to these lands. They stumbled through the wilderness until the day when they have reached the lone mountain, now known as “Říp”. The very next dawn Čech, exhausted by the lengthy journey just the same as his kin, climbed the mountain to seek out the best path to take. But there was no need – it was at the very peak of this mountain where he understood that their search was over. They’ve found their promised land, hidden from the outside world by mountain ranges, full of fertile fields, beautiful blossoming nature and strong, fresh rivers. Overcome with happiness, he trotted down to his fellow friends and shared the news. The ponies rejoiced at the discovery and in turn, declared the name of their new home to be Czequestria! Peace, harmony and friendship have been bestowed upon them in these lands. Long gone was the distrust that shrouded their minds. But even such perfection was not to last forever and the time came when the wise and just Čech became too old to keep the peace. Old quarrels slowly, but surely, made their return and with Čech being no longer able to resolve them it was then when he decided to step down and pass the rule to his younger brother. But to everypony’s surprise, his brother Lech honorably rejected the offer! In turn he named the young ambitious unicorn and his great friend, Krok, to be the new leader and judge of Czech ponies. No conflict, grudge or problem escaped his sight and ear and for this, ponies from all of the land were coming to his door for advice and help. Thus the peace and harmony of Czech ponies was restored, once more! Unicorn Krok was gifted with 3 daughters during his rule. Each and every one of them ambitious and loved by his subjects. The eldest was named Kazi. Her magic could cure and heal even the direst of illnesses and her knowledge of herbs was as great as of the legendary Zebra’s from lands far, far away! His second daughter, named Teta, was able to communicate with the spirits of the land as well as use the ancient magic of runes to aid those in need. The youngest daughter was Libussa. She inherited the sense of justice and righteousness after her father and her magic was able to breach time itself, revealing what the future holds! In turn, her wisdom and prophecies brought her a cutie mark of an astronomical clock, which, in time, has been made real and named the Prague’s Orloj. Libussa won´t ever forget the very first of her visions. That day marked the anniversary of the Elder earth pony Čech stood on the mountain Říp. The whole day was one great party – tiaras were being weaved from wild flowers, the juiciest grass with forest honey served as a feast and in the evening everypony danced to the sound of strings until they´re hooves would carry them. In the evening Libussa lied in the soft grass and watched the starry sky above. As she looked upon it and contemplated life, suddenly it was as if a curtain has been drawn – the starry sky retreated and instead she saw something that struck her to her core. She saw the very things that Čech and Lech ran from flooding her promised land – distrust and discord. Not only that – she also witnessed the arrival of mankind. They brought with them the skill of earth ponies, the wit of unicorns and the freedom of pegasi. Her vision showed, how even without the magic of cutie marks they would rise up to the ponies and even grow beyond them. But she also witnessed, where would the human progress carry them – to war, chaos and hatred. This vision has awoken in her a great sadness. When her sister saw it, they hugged her in a tight embrace and she told them everything. They all cried their eyes out together. When even the last tear dried out, they looked at each other and in their looks they saw iron determination: this prophecy must never come true. It was clear to them, than nopony could fully prevent the rise of mankind, wars and strife. For if their ancestors couldn´t prevent quarrels amongst ponies, how could they prevent them amongst humans? The existence of ponykind was to be forever hidden from humans. Traces about the existence of ponies would be overlooked, records would fade away and someone would try to tell somebody about ponies, he would fail. If a human were to see a pony, it wouldn´t appear to him as a pony, but as a human and such a sight would easily slip from his mind. This mighty spell would forever ensure that ponies were to remain safe. Teta brought her most powerful potions and drew a magic circle around Libussa with mystic herbs. Kazi consulted volumes made of birch bark, on which were inscribed mighty and ancient spells of her people. She saw a great city, built by human hands, marked by pony craft. In it humans and ponies walked in unity, side by side. To humans ponies seemed as one of them. Ponies conversed with humans, listened to them, advised them. In a nation in which the times of peace and prosperity were always threatened by chaos and despair, were ponies the force which from it´s secrecy lead to the growing power of friendship and harmony. 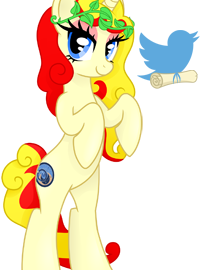 When Libussa stood again on the firm ground and the spell was finished, something, which wasn´t on her flank before appeared – her new cutie mark. The symbol of the astronomical clock, or, as it would be called in the future, the Orloj, symbolized her connection to the flow of time and to the passage of life. 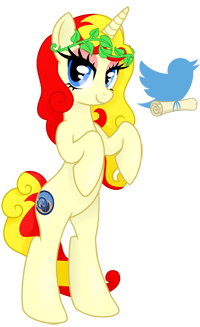 Right away a herd of ponies gathered around her, demanding explanation of the strange light and admiring her new cutie mark. When the sisters together announced to ponies the great thing that just happened, her father, the duke Krok, stepped forward and named his daughter duchess. From that moment Libussa ruled wisely and justly and awaited the arrival of mankind. The spell had also one effect that the sisters didn´t plan for – whilst they gradually went from youth into maturity, Libussa never aged. The power of the spell kept her forever young. It was hard for her to see her family and friends pass into the afterlife, but their place in her heart always filled someone from her pleasingly growing nation. And the humans came. Many came and settled besides ponies. It wasn´t always easy to coexist, but for every evil she was able to find twice the amount of good around her. As time went by, she began to realize how hurtful the spell could become. Ponies fell in love with humans, to which they couldn´t fully express their feelings. Often she thought that she could do more good from out in the open rather than in secrecy. Thus she went seeking advice to the place, from which her people ran so long ago – to Equestria. There she witnessed the might of the Magic of Friendship. With its help she was able to soften the spell to such a degree, that it became possible to reveal to some humans the existence of ponykind. They then with the help of their imagination and a new medium called “television” began to spread the ideas of friendship and ponies not only amongst her nation, but throughout the world. Who knows, maybe some pony sits right next to you. Maybe, that Libussa too shall choose you to help her towards a brighter future!